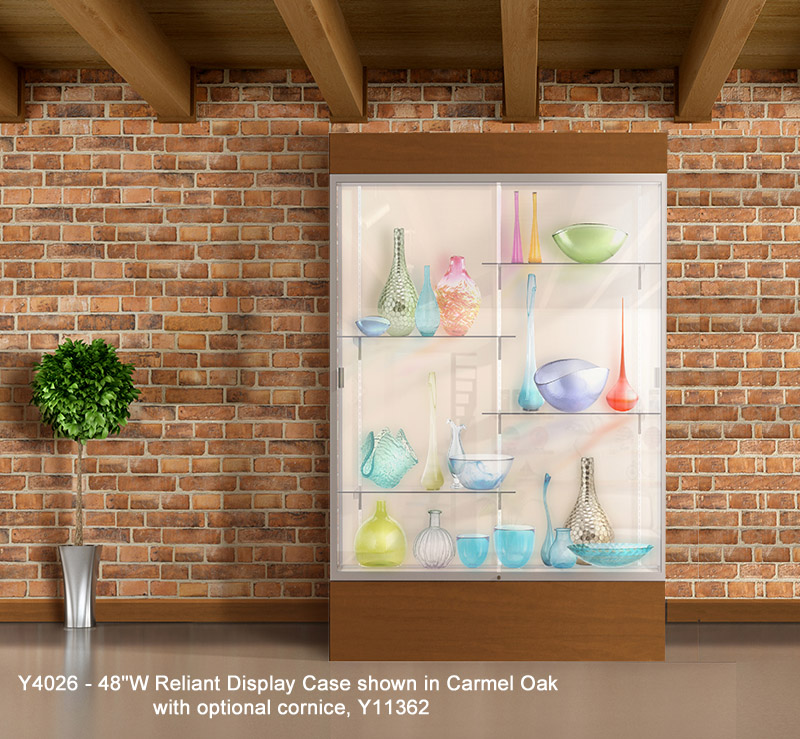 Reliant Series display cabinets combine the strength and durability of aluminum with the engaging look of wood. Anodized aluminum framing secures the sliding glass doors and incorporates a built-in lock. The accent wood completes the design for a clean, uncluttered appearance. Ideal for either traditional or contemporary settings. The Reliant Series is a value-packed choice for the protected display of your treasured memorabilia. 48" Wide Reliant Display Case sold above. Other sizes and optional cornices sold below. Each case offers three options to customize the case to your environment. The finish is available in either a beautifully finished genuine wood veneer for the most impressive appearance; or a durable vinyl laminate for easy care in high traffic areas -- both priced the same. The aluminum framework gives you a choice of three finishes. 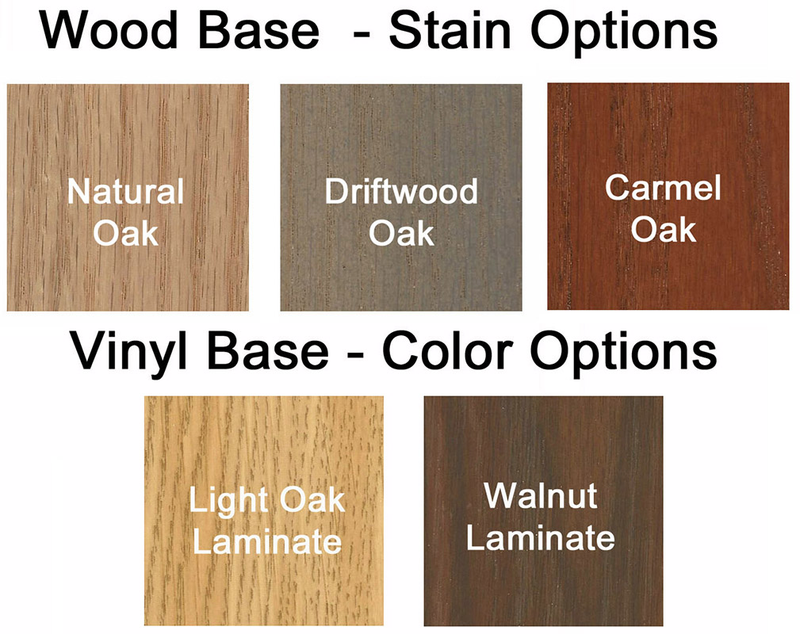 Click on inset for wood/laminate and frame options. The background of each case is available in a mirrored background for 360 degree perspective, a clean bright white laminate background or a plaque fabric background for hanging your prized plaques or other objects (velcro tape included). 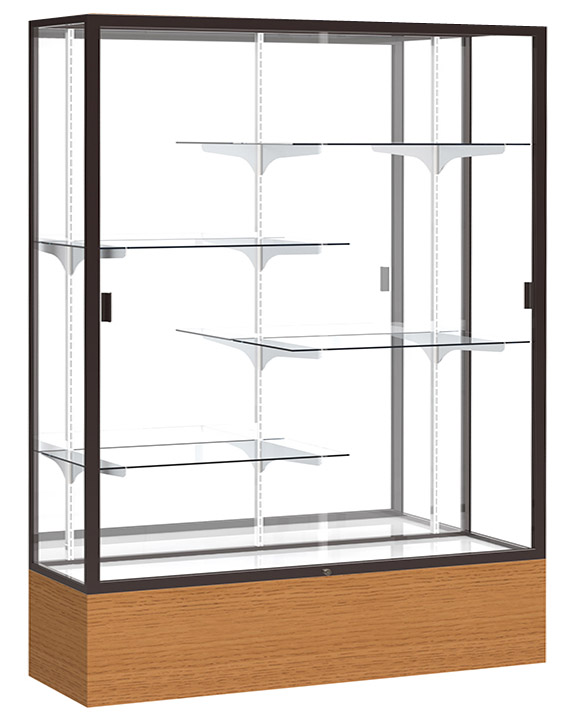 Y4026 - 48"W Display Cabinet includes four adjustable tempered glass shelves with hardware. Measures 48"W x 16"D x 72"H overall. Ships fully assembled. Shipping weight 279 lbs. PRICE INCLUDES SHIPPING! (Truck shipment - see Terms & Conditions). Please allow 3-4 weeks for delivery. 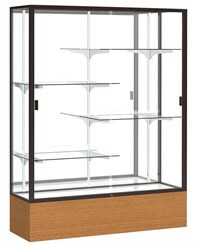 48"W Cornice/Lighting Fixture fits the Y4026 48"W Reliant Display Case for illumination of your awards and accomplishments. Comes with fluorescent light bulb and power cord. Shpg. weight 60 lbs. Ships assembled. PRICE INCLUDES SHIPPING! 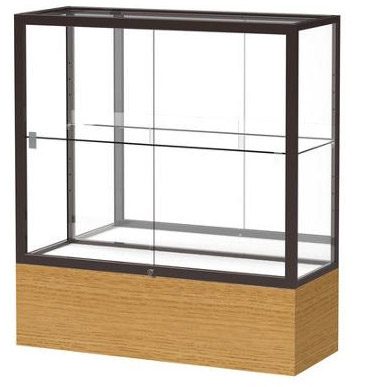 60"W Reliant Display Case securely display your prestigious awards, trophies, plaques and more! Pedestal base available in beautiful oak veneer for a stunning display or vinyl laminates for durability and long lasting wear. 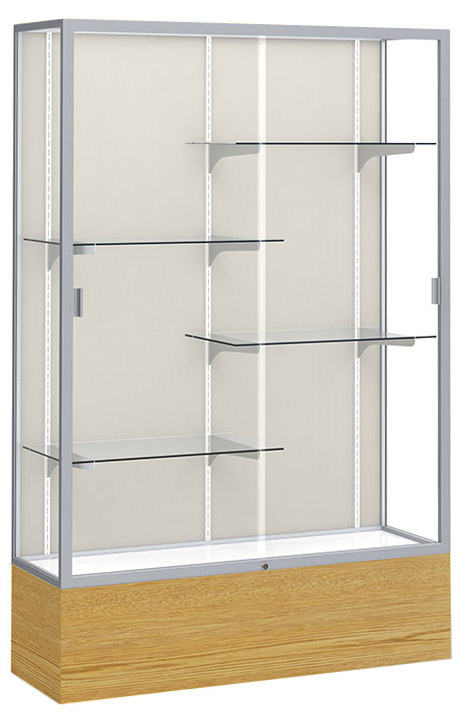 Includes four adjustable tempered glass shelves and hardware. Ships fully assembled. Measures 60"W x 16"D x 72"H overall. Shipping weight 457 lbs. PRICE INCLUDES SHIPPING! (Truck shipment - see Terms & Conditions). 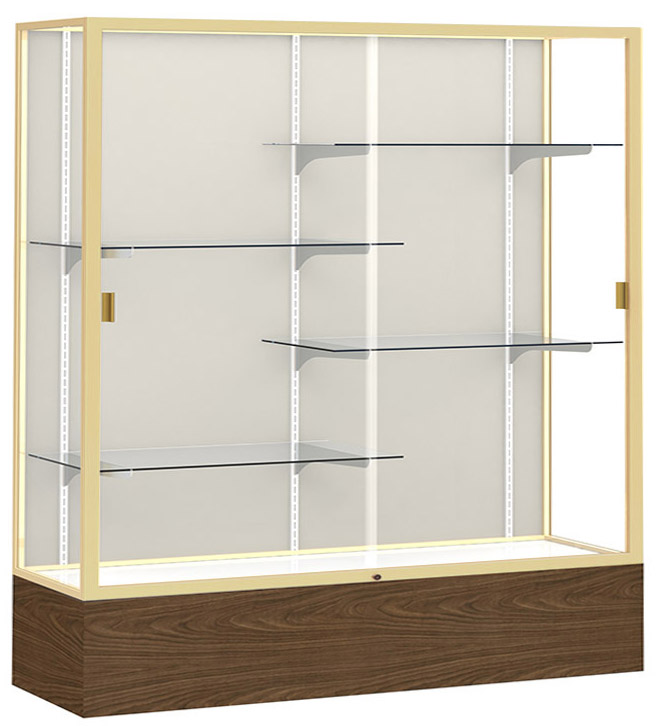 60"W Cornice/Lighting Fixture fits the Y4027 60"W Reliant Display Case for illumination of your awards and accomplishments. Comes with fluorescent light bulb and power cord. Shpg. weight 70 lbs. Ships assembled. PRICE INCLUDES SHIPPING! 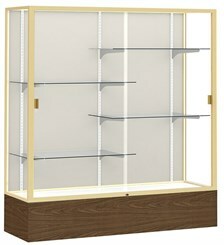 72"W Reliant Display Case securely display your prestigious awards, trophies, plaques and more! Pedestal base available in beautiful oak veneer for a stunning display or vinyl laminates for durability and long lasting wear. Includes four adjustable tempered glass shelves and hardware. Ships fully assembled. Measures 72"W x 16"D x 72"H overall. Shipping weight 546lbs. PRICE INCLUDES SHIPPING! (Truck shipment - see Terms & Conditions). Shown above on 72" Wide Display Case. Measures 72"W x 16"D x 8"H overall. Shipping weight 60 lbs. PRICE INCLUDES SHIPPING! (Truck shipment - see Terms & Conditions).